"At the gym today, I saw a new trainer training a new guy. He was an older guy, very tall and quite a bit overweight. She was young and skinny. They caught my attention because the guy was noticeably fatigued and rather loud in voicing his irritability. He sighed deeply whenever he was told to do another exercise. Now that didn't surprise me, because being trained is tough and for new people, it can be an emotional adjustment. What surprised me was the trainer. Normally the trainers at the small private gym I attend are very professional and excellent. This trainer however, seemed to be in a bad mood herself. She was curt to her client, barked out her directions, and would walk away frequently after he started. When he complained about being fatigued, she didn't say much, and just kept telling him what to do. 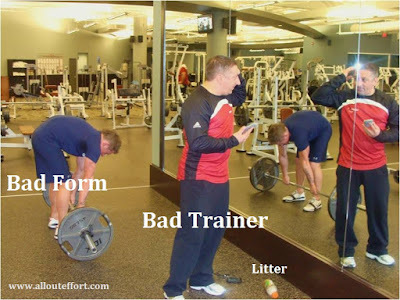 Now I'm not a trainer, and I don't know the whole story here, but I felt uncomfortable watching them interact and I felt sympathetic to both of them, because it was clear they BOTH didn't want to be there. Having being trained before, I understand what it's like to not want to be trained. I haven't been a trainer, but I feel like, as a client, if I am paying you to train me, I would like you to at least pretend like you want to be there. Preferably, I would want you to actually want to be there. Now I'm not advocating a trainer should be a therapist or a friend, not at all. I simply would like them to be present for each exercise, each repetition, like the client is suppose to do. Be there physically, but most importantly, be there with them on that emotional level, to provide them with the encouragement they need and quite frankly, are paying you high hourly rate, for. I would want my trainer to like this. I feel like this relationship can't really be taught in a classroom or a book, I think it has to be shown in person, by a great trainer who understands this, who can mentor and teach trainers how to treat their clients like this, like an apprenticeship. I believe much of All Out Effort's success can be attributed to having an owner who truly understands what it is to care for their clients."